CHILLIWACK, BC – Ground has broken on a new trail project at Cultus Lake, that will offer a unique opportunity to residents and visitors. A footpath is being created for all ages and abilities, allowing nature-lovers to walk, run or cycle around the entire lake. Starting with a 10km section on the east side of the lake, the path will eventually be extended to a 25k circular route. It will be informative and educational, as well as beautiful, featuring interpretive First Nations signage celebrating the history and ecology of the lake and its region. 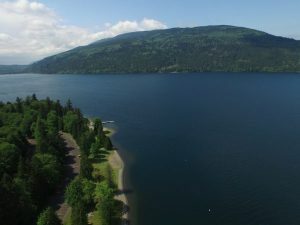 The trail was the idea of Jim Young, a Cultus Lake homeowner and the co-developer of Lakeside Cultus Lake, a luxury resort development on the northeastern shore. Young, who is part of a four-generation family on the lake, has been coming to the area since he was 10. Young is spearheading the Lakeside Trail project along with local residents. The idea took hold a couple of years ago as a means to allow residents and visitors in nearby recreational property developments to have access to the lake. There is currently no safe route to the water other than by driving. “I was involved in the area planning and saw that we could get all those people down to the lake with this solution, so I said, ‘Let’s put it in the plan,’” and Chilliwack city planners agreed. It now has the support of every community in the neighbourhood, the City of Chilliwack, the local regional district, the Ministry of Highways, the Ministry of the Environment and local MLA. As well, the project is receiving grant funding from a variety of sources such as the Fraser Valley Regional District . The Lakeside Trail project now has 10 volunteers on its committee and they are just about one year in of a five-year plan. The actual trail building is starting in front of The Cottages at the south end. The two-metre-wide path will run parallel to the Columbia Valley Highway, between the highway and the lake, so users will always have a view of the lake and access to it without having to cross the highway. The intention is to have First Nations educational signage, a fitness circuit and possibly a friendly competitive 10km run in the future. Having no ladders and no steps, it can be enjoyed walking, biking and even with a running stroller. The trail will pass right by and offer direct access to Lakeside Cultus Lake, a resort-style residence and marina. Surrounded by one of the most popular provincial parks in British Columbia, this development is the last waterfront location on the lake that has freehold ownership opportunity. Young sees the trail project and resort community as a landmark and legacy for future generations.